There are over 125 varieties of goldfish. More varieties than any other fish species and they are the most popular domesticated aquatic life in the world. If you’re reading this, it’s likely that you’re one of the many people who love goldfish and interested in learning more about goldfish. You’re in good company because goldfish make excellent pets. With so many varieties it’s especially important to understand goldfish behavior. Keeping goldfish is also one of the most popular forms of pet ownership. This might seem surprising because you can’t stroke, play or walk a fish. These creatures are from the depths of what is to us an alien world, water. The fact that goldfish are not noisy or demanding is a considerable advantage for having them as pets. Goldfish can be kept in places where other bigger, louder pets might not be appreciated or it would be a problem to look after them. For example housing pets in high-rise apartments or condos. It’s a proven scientific fact that having to care for another life form is important in a stable psychological makeup. When children are given the task of goldfish care it helps them to develop a sense of responsibility. Developing such a skill, and quality, is a benefit and serves them well into adulthood. Goldfish are attractive as pets because they can be kept with relatively little maintenance. Unlike other pets, goldfish don’t need to be housebroken, won’t beg at the table for food and you’ll never have to cover up the sofa when you are not going to be home. The wonderful thing about goldfish is that they are quite a hardy fish and are fairly adaptable. Goldfish are excellent candidates for outdoor pools or ponds, in almost any climate. Because goldfish come in such a wide range of body shapes, colors and general disposition, there is a goldfish for everyone. Welcome to the wonderful world of goldfish ownership, you’re in for a treat. With the help of this blog you’re well on your way to experiencing the joys of taking care of goldfish. 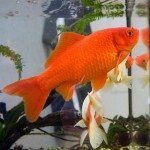 I’m sure you’ll enjoy watching and learning about goldfish behavior.